While Italian Arturo Merzario embraced American culture with his trademark cowboy hat, German Hans Heyer stayed closer to home in his openly exposure of xenophilia: the Westphalia resident (Germany's flattest province!) never left home without a Tyrolean hat as his good-luck charm. The seventies touring car ace, however, never made his mark on F1 in the way Merzario did. 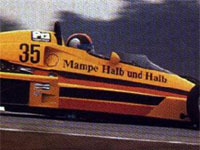 In fact, Heyer's only F1 start was a freak appearance. Drafted in for a one-off at his home GP, the 1974 European Touring Car Champion looked destined for a two-day F1 career, when he failed to make the cut in Gunther Schmid's second ATS Penske - but for undiscovered reasons he managed to prolong his stay in F1 for another day by somehow making his way into Sunday's race! Maybe the failing starting lights causing confusion on the grid were the cause of Heyer's illegal participation. Although Heyer set 27th time on Saturday and 24 cars were allowed to start the race, the race officials completely overlooked him when the German flag was waved and Hans drove out of the pits to join the rest of the field. The wayward stewards only discovered their mistake when Hans retired with a broken gear linkage... He was subsequently disqualified. Until this day statistical anoraks feud over Heyer's single GP appearance. Should he be credited with it or should we agree that his race never officially happened? Yeah, just like Michael Schumacher never finished second in the 1997 championship!